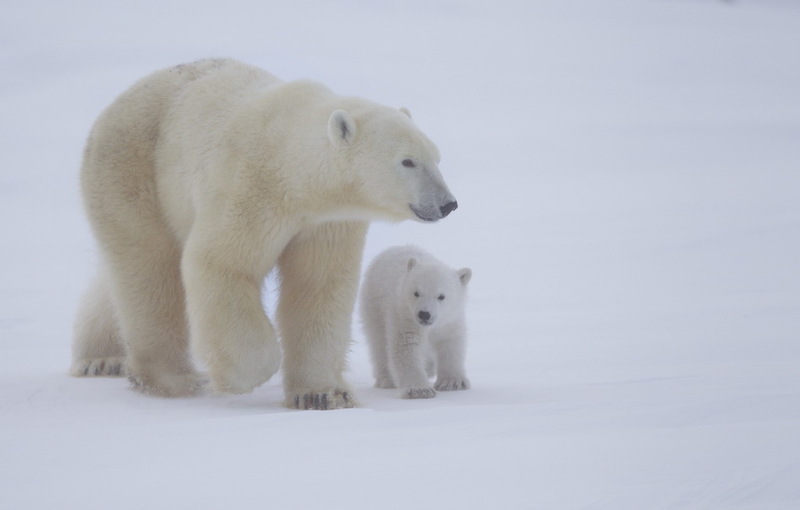 THIS IS DAY THREE FOR THE CUB OUT FROM THE DEN WITH MOM. What a beautiful frame, Peter! Love the approach angle with both bears separated and headed in your direction. Mom's raised paw provides a nice touch of action. And the detail in the bears is ideal. The pose of mom, with her head over the little cub, hints of "protection," and provides a great sense of scale. An image to be proud of – it's priceless. You certainly got some lovely behaviour captures between the sow and cub, Peter. What a shame the conditions weren't better to give you a clearer view of these wonderful animals - it looks like it was quite foggy in both images so far - or was it just low light and the extreme cold affecting photography when you were there? It must be a wonderful trip and an amazing experience to see these very young cubs when they emerge from the birth den. Excellent! As was said - the raised paw add a lot to the image. Thanks for your note, Peter, I can only imagine what it was like for photography in the bitter cold of minus 40-50 C and no sun for five days! You did a fantastic job to get such great shots under those conditions!